We believe every wedding can benefit from having the involvement of a Wedding Designer or Co-ordinator even if it is just for on the day piece of mind. Every wedding is unique and should be tailor made to your vision, leaving you stress-free to experience your perfect memorable day. We know where to source exactly what you’re looking for and how to put it together. We give you continuity – one main point of contact who is a dependable local resource throughout your planning. For couples needing extra hands and help in the build up to their big day (or if it all gets too much and you need support) we offer ‘wedding week’ as well as ‘wedding day’ assistance. On the day of your wedding we will oversee the celebration and manage every aspect so you can relax and enjoy your day knowing everything is being arranged exactly as you desired. An intimate church service at the beautiful Church of the Good Shepherd followed by photos in this picturesque location alongside the turquoise water of the lake. A boat arrives and you are whisked across the lake to a secluded spot where a sumptuous meal is created by Tekapo Cruises. You sit down to fine dining amongst the unbelievable grandeur of Lake Tekapo. A slow boat cruise home completes the perfect romantic day. A lakeside wedding ceremony with your closest friends....everyone gathers against the incomparable backdrop of the Mackenzie Country and your service starts. Celebrations commence with champagne followed by a picnic hamper being thrown open with a selection of the finest hors d'oeuvres the South Island has to offer. A helicopter arrives to fly you and your wedding party high onto the top of one of the majestic peaks of the Southern Alps. Your photos will capture this breathtaking scene before you're whisked away to enjoy more of the surrounding scenery before returning to Tekapo village. You and an intimate group of your closest friends and/or family will enjoy a private gourmet dinner cooked by a personal chef at your accommodation in Tekapo. This would be followed by a relaxing evening before the wedding day. With your ceremony either at your house or on the lakeside, be married with a backdrop of stunning Tekapo views. 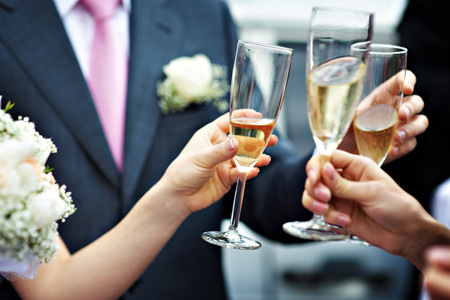 Celebrate with a glass of champagne at the conclusion of your ceremony followed by a selection of gourmet canapes. Simple and elegant, a wedding set against the majestic backdrop of Lake Tekapo and the Southern Alps where your service takes place right on the lakeside under a sun drenched sky. The guests assemble and mingle amongst the natural surroundings that run along the lake's edge and as the service starts the backdrop becomes the brilliant turquoise water and soaring peaks of the Southern Alps. Music and laughter fill the air as champagne is popped, toasts are offered and the celebrations begin. Picnic rugs laid in the grass have gorgeous hampers, overflowing with the best food the South Island has to offer for everyone to savour and enjoy. Natural, simple, elegant.